According to Benioff, "Cersei hated the name 'Ser Pounce' so much she could not allow him to survive. So she came up with her most diabolical [execution]. Ser Pounce's death was so horrible we could not even put it on the air. " 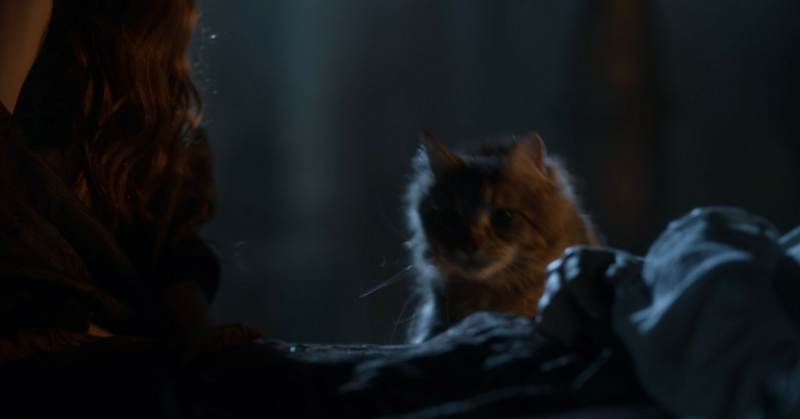 Ser Pounce's death may not come as a surprise, given that the cat only appeared in a single episode, back in season 4's" Oathkeeper Seriously, the recent reappearance of long-missing characters like Beric Dondarion and Gendry in season 7 left some fans hoping Ser Pounce might have a return in store, too, despite the death of his owner, Tommen Baratheon. Tommen committed suicide back in season 5, after his wife Margaery was killed in the explosion that destroyed the Great Sept of Baelor. Actor Dean-Charles Chapman, who portrayed Tommen, commented back in 2016 that he hoped Ser Pounce "did not get caught up in the blast," and that the cat would "move on with his life and get a girlfriend maybe," in the wake of that tragedy. Plot points aside, so it's possible that the two showrunners may have had other reasons for killing off the cat off-screen – simply, that seems to be the cat that played Ser Pounce was child of a diva. "That cat is really not working," Benioff notes in the same interview. "Dogs generally do what you ask them to do if they're smart and well trained," Weiss says. "Cats have their own agenda." Huffington Post HAPPYTON POST HAPPYTON POST Hey what just loving life. He just really was not on his game that day. "Chapman went on to speculate," I think that was the reason why they did not back him because it's just hard work. Cats can not understand English, so you tell a cat, 'Come on. Jump on the bed, and what's the point of view for you? " And Natalie Dormer – who shared the scene with Ser Pounce and Chapman – so the issue in a 2014 Reddit AMA, commenting that "Ser Pounce was a bit of a diva that day, he did not want to stay on the bed, he was very difficult to work with." It seems that inability to play with others led to Ser Pounce finally being killed off-screen. Game of thrones characters and their audience. The Verge 's managing editor, TC Sottek – whose 2016 Game of Thrones Team was named "Ser Pounce's Feral Menagerie" – which quoted as saying: "I am very sad." Game of Thrones wants to return on April 14th with its eighth and final season. Ser Pounce certainly will not be the last character to meet at untimely, messy fate before the end.